Orbis Terrae Compendiosa Descriptio Quam ex Magna Vniuersali Gerardi Mercatoris … - MERCATOR, R. / HONDIUS, J. Title : Orbis Terrae Compendiosa Descriptio Quam ex Magna Vniuersali Gerardi Mercatoris …. Map maker : MERCATOR, R. / HONDIUS, J.. Size : 11.2 x 20.7 inches. / 28.5 x 52.5 cm. Description :World map in two hemispheres from L'Atlas Ou Méditations Cosmographiques De La Fabrique Du Monde Et Figure D'Iceluy ... .
Gerard Mercator's great world map of 1569 was condensed into double hemispherical form by his son Rumold to Isaac Casaubon's edition of Strabo's Geographia published in Geneva in 1587 with columns of text beneath the map. 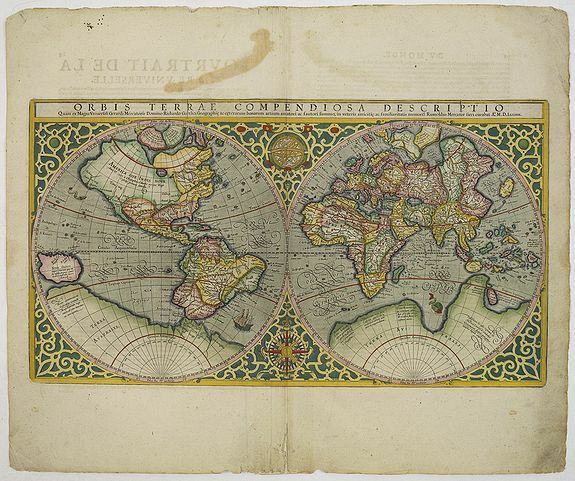 Later this map was incorporated into editions of Mercator / Hondius's atlases. From the first French text edition. Text on verso starts with Pourtrait de la Terre Universelle. By 1603 cracks had developed in the top edge of the plate and by the 1620s these had extended in two places almost completely across the top box containing the title. This particular map has evidence of one crack in the copperplate across the left side of the title. The engraving is a model of clarity and neatness, with typical cursive flourishes to the lettering of the sea names. Surrounding the hemispheres is a strapwork border, between them at the top is an armillary sphere and at the bottom an elaborate compass rose. Including a Northwest Passage, unusual depiction of the North Pole, massive Terrae Australis, narrow passage between South America and Terrae Australis, bulging western portion of South America and unusual treatment of North America. Some of the place names mentioned by Marco Polo in Asia are present, as are several of the mythical islands of the Atlantic.